Mad Men made Jon Hamm. While the actor has been working for two decades, it was his role as Don Draper on AMC’s critical hit series (note: that’s the other AMC) that turned him into a household name even as Mad Men helped reshape the TV landscape. The role defined Hamm’s career, but it did not show off his great talent for comedy. Hamm has explored a wide variety of comedic roles, many of which deliberately play against the type cultivated by the AMC series. 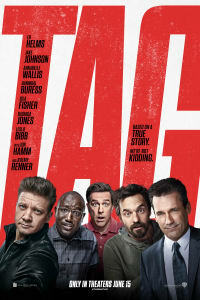 Tag, opening June 15, is Hamm’s latest comedy, and he’s got more funny work ahead on television. Let’s look back at the laughs Hamm has given us, with his top five comedic roles. During his full-time role on Mad Men, Hamm also made time to appear on Tina Fey’s hit comedy series 30 Rock. Recurring over a three year period, he portrayed Dr. Drew Baird, the neighbor of Fey’s Liz Lemon. Though he may be dashing and kind-hearted, it doesn’t take long for Liz to discover that Dr. Drew is actually an imbecile. His total lack of smarts got him into absurd situations, including a pretty serious helicopter mishap. His misfortune resulted in a lot of the show’s most hilarious moments — one standout being his inability to ride his own motorcycle. Though he only appeared in seven of the show’s 138 episodes, Hamm’s work as Drew had a lasting impact. Not only was he responsible for big laughs, the role highlighted Hamm’s versatility thanks to demands that were wildly different from those of Mad Men. Hamm’s first mainstream comedy film, Friends With Kids, put him in the room with Jennifer Westfeldt, Kristen Wiig, Adam Scott, Maya Rudolph, Chris O’ Dowd, Megan Fox and Edward Burns. The film was written and directed by Westfeldt (Hamm’s partner at the time), and produced by Westfeldt and Hamm. Hamm and Wiig play newlyweds, Ben and Missy, who just can’t get enough of each other. But as time passes, life begins to put a strain on their marriage. Their journey ultimately inspires unmarried friends Jason (Scott) and Julie (Westfeldt) to have a baby together. Given that it’s an ensemble film, Hamm and Wiig serve the cast as a whole rather than standing out as leads. That doesn’t stop them from delivering straight-up hilarious moments in this witty and surprisingly heartwarming film. Hamm’s solid build and square jaw make him an obvious choice for tough-guy roles, and he merged that appeal with comedy in 2016’s Keeping Up With The Joneses. 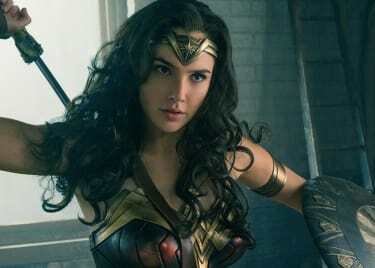 The film centers on a suburban couple (Zach Galifianakis and Isla Fisher) who investigate their new neighbors (Hamm and Gal Gadot), unaware that they are actually secret agents. The film is every bit as crazy as it sounds and is full of laugh-out-loud moments. Furthermore, the dynamic between Hamm and Galifianakis makes for some priceless scenes. 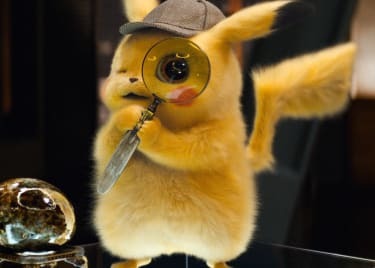 Though the film disappointed at the box office, it remains a fun adventure that will have you laughing every five minutes. 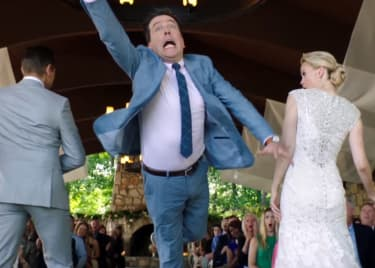 And whether as a doting husband, suave secret agent or eye-rolling mentor, this movie showed off Hamm’s abilities with all facets of his character. One of Hamm’s funniest performances is in Absolutely Fabulous: The Movie, in which he played himself. The sequel to the popular British sitcom brings Jennifer Saunders and Joanna Lumley back to their roles as heavy-drinking, fame-obsessed pariahs Edina Monsoon and Patsy Stone. Hamm appears as one of the guests at a party orchestrated by the pair to sway Kate Moss. Though his role is brief, it is also memorable. This version of the actor had a history with Patsy, who reminds him of their love affair with vivid gestures. With a simple facial expression, Hamm is able to convey every bit of fright, disgust and shock that the fictional version of him clearly feels. He caps off the interaction with a beautifully delivered line in which he reveals that he’s shocked to find out Patsy is still “alive”. Though he can’t have been too ashamed of the pair’s tryst as he subsequently tries to rescue Kate Moss, covered in Patsy’s lipstick. Following his 30 Rock role, Hamm had a recurring role in Tina Fey’s next show, Netflix’s acclaimed sitcom Unbreakable Kimmy Schmidt. The show centers on Kimmy, who returns to normal life after being imprisoned by a doomsday cult for 15 years. Hamm plays the cult leader, Reverend Richard Wayne Gary Wayne, who refers to God as “Gosh” and Jesus as “Jeepers”. He also believes that Jesus had a crazy step-brother named Terry. As this off-the-wall, larger-than-life character, it was easy for Hamm to steal every single scene he was in. Catch Jon Hamm in Tag when it hits theaters on June 15, 2018.